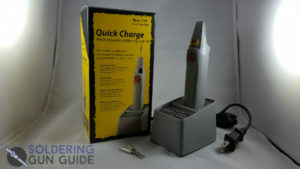 On our bench today was the ISO-TIP 7700 Quick Charge Cordless Soldering Iron. A full review of this iron follows our unboxing video below. This iron has been around for quite some time – over twenty years. During that time, the company behind it has changed, however the design and build quality has remained consistent. The ISO-TIP line was previously owned by the Wahl Clipper Corporation but was sold to Senasys in 2008. 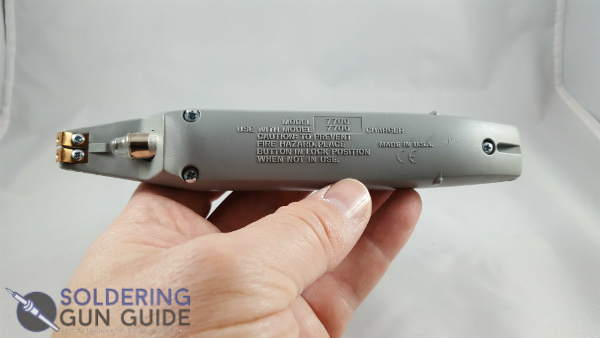 This was our first hands-on with the product, however many professionals in the industry have been using the ISO-TIP 7700 for decades and report that the current version continues the steller reputation of this product line. The moment we removed this iron from the packaging, we could sense that it is a quality built iron. Picking it up gives the user an impression of a substantial product, not some cheap knock-off. Actually using the iron confirmed our sense of build quality – it heated up quickly and worked reliably every time we used it. It literally heats up in about six seconds! The light near the tip is very handy, especially when you are away from the bench or working in a confined area. The iron is easy to hold in one hand and our hand didn’t cramp up while using it. A needle point tip is available (sold separately). While we didn’t have an opportunity to test it, this is perfect when precision is needed. Our previous review of the Hakko 901 did not offer this option. Additionally, the iron sports excellent battery life. The battery lasts a long time and only needs to be replaced every five years or so. 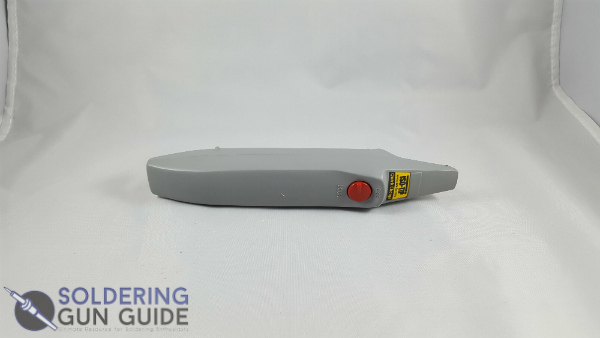 When replacement of the battery or accessories is needed, it is nice to know that the components of this iron have remained consistent over the years, so tips, batteries, etc are compatible across all generations of the product. Our biggest gripe with this product is the design of the tips and the way that they attach to the iron. The tips insert into the end of the iron and are held in place by tension. This is all fine and good, unless you are applying any pressure to the end of the tip while soldering, in which case it is possible for the tip to fall out in the middle of a job. We rarely apply pressure with the tip while soldering, but it is apparently a problem for other users. We wished that the tip attachment design was better. The other minor gripe we had, is the operation of the power switch. The design is a little confusing as it rotates freely, and it’s easy to accidentally switch the iron off in the middle of a job. Likewise, we worried that the iron could accidentally turn on during shipping or storage. Finally, we didn’t like the fact that there is no status light on the soldering iron or the charger to indicate when the unit is on, or when it is charging. This is especially annoying when placing the iron on the base – it would be nice if there was a visual indication that the base is receiving power and that the connection between the base and the iron is good. Further, it would be nice if there was a visual indication of when the battery is fully charged (like a light that changes from off to red when charging and changes again from red to green when fully charged). 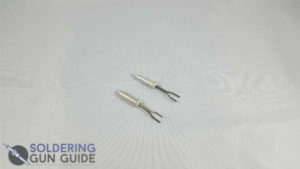 EDIT: We later discovered that the tension issue mentioned above can be mitigated by securing the ends of the solder tip under each screw attached to the retainer clips on the back of the iron. This will provide a more secure tip at the expense of a quicker tip swap – good information to know for people who don’t change tips often. This iron is just so darn handy. The ability to charge it and then store it away in your toolbox and forget about it until needed, is nice. Given that we haven’t been using this iron for years, we can’t say how long the battery will hold a charge, but by all accounts it is several months. 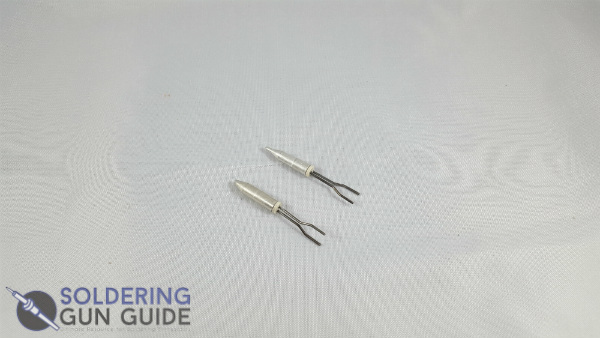 Not having to mess with an extension cord and being able to make a quick and accurate solder, desolder, touch-up, or repair is very convenient. The need to no longer keep butane on hand cannot be understated. We had a few minor gripes with this ISO-TIP 7700, but overall we really liked it. We especially liked the build quality, quick heat up, battery life, convenience, and the fact that it is made in the USA. 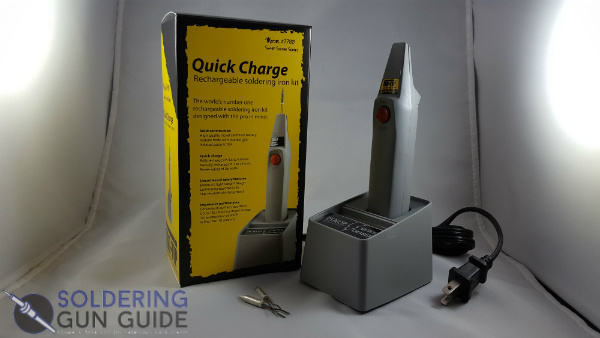 If you are looking for a cordless soldering iron, definitely consider this one!